Torso pitch: -25° to +35° while standing. -25° to +45° while crouching. 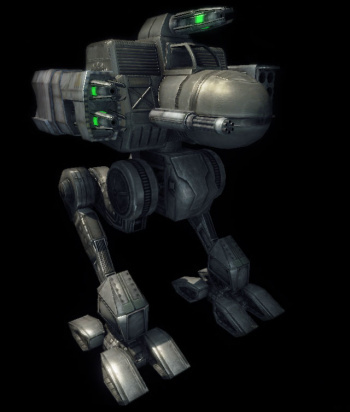 The Osiris is an Inner Sphere Light Mech that packs heavy firepower and maneuverability at the cost of limited armor. With a relatively similar appearance to the Raven, an Osiris can be difficult to hit if the pilot maneuvers well and uses available cover effectively, but if blows start to land, or if the Osiris runs out of space to move, death can come rather abruptly. All Osirises, except for the A variant are equipped with Jump Jets, making it easy for pilots to approach and escape using unanticipated directions. The Osiris Prime packs a heavy-hitting close- to mid-range arsenal on a fairly maneuverable platform with the heavier armor of the Osiris brawler trio. Four ERMBLs provide the main punch, reaching out and damaging the enemy at appreciable range, while an SRM6 gives it an extra little boost in firepower at close range. The Prime Variant is a brawler at heart, and is meant to dash into enemy lines aided by its improved jump jets, disrupting coordination and line-of-sight, all the while pummeling targets with its varied weaponry. Thanks to its battery of lasers, it also excels at hunting Battle Armor, allowing larger friendly Mechs to focus on juicier targets in relative safety. The A variant focuses on Energy Weapons. Its 3 MXPLs offer impressive firepower at medium-range, and its SSRM4 pack give the Osiris A a well-rounded profile. 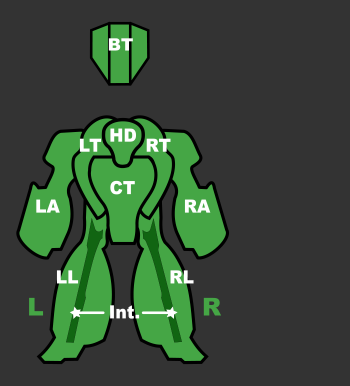 The A variant is an effective Light Mech hunter using its speed and impressive torso rotation to lay down a wall of pulse fire, even while at a full run. This variant lacks jump jets, and also has a very long window of engagement, owing to the fast-firing but low-damage per shot nature of its lasers. The second of the Osiris brawler trio, it's one of the better armored variants. The B variant carries 6 tons of armor. Most of its punch comes from its Tbolt10 and LPPC. Both weapons are difficult to land on smaller, faster targets, but allow the variant to prey upon heavier assets, preferably jumping from cover with its iJJs, against which more experienced players will find they can consistently land salvoes even while running passive radar. 3 SPLs turns the Osiris B an in your face Mech or for those pesky BAs. Make sure you load up the extra 1 free ton and be mindful of your heat as this unit carries only one DHS. The C variant mounts 1 standard IS PPC, which gives it impressive striking power for a light Mech. This is backed by 3 SBLs and an SRM6 pack for close-range work. Thanks to its high speed, 360° torso twist and good range, it can be used as a effective harasser and hit-and-run Mech, well suited to kiting enemies at range and finishing them off up close. A brawler at heart, it may find itself outgunned by other units at long range, but dedicated brawlers can still overwhelm it if not softened from afar. The Osiris D is a starter capable of providing sustained direct fire support and even Anti-Air duties- in a pinch. The pair of RAC2 can reach out to 800m, however it takes a skilled pilot to lead these projectiles against other light mechs effectively. In comparison, the more cumbersome later assets with larger components make a much more ideal target, along with hovercraft, tanks and vehicles which incur a damage bonus from the autocannons. The spread of the autocannons limit its accuracy at the maximum 800m, but pilots should also be wary of close range brawling- a dangerous prospect with this variant's reduced armor and inability to torso twist without severely affecting its damage output. It is equipped with a GECM to mask your radar presence, a helpful feature magnified by the impressive maneuverability granted by the Improved Jumpjets allow for you to both stalk your prey and safely slip out of sticky situations unnoticed. While 2 Free tons of ammo are barely enough to feed the incredibly hungry autocannons, its swift speed make trips to rearm quick, and will probably be part of a well needed trip to the repair pad as well. Despite the Osiris D lacking any extra heatsinks, it is practically impossible to overheat. The E variant is the least armored Osiris at 5 tons. It carries a LtGauss along with 3x MGs, giving it an especially long-range attack not common to light Mechs. One ERMBL for 600m and under rounds out this Mechs fire power. Combined with EOptics, its iJJs and a 2 free tons for carrying additional ammunition, the Osiris E is capable of striking at extreme distance and jump sniping with relative ease. Unfortunately, this Mech's firepower is quite limited at full output, suitable for sniping - finishing cripples - backcapping, the pilot should be thinking of ways to use the improved jumpjets to put an obstacle between them and reposition. Known as 'Rudolph', the Osiris F is the most armored variant of the brawler trio, and even more brawl-oriented than the Osiris Prime due to its shorter maximum weapon range. In place of the ERMBLs, the F carries 6 ERSBLs which trade range for efficiency and fire rate. The Prime's SRM6 pack is replaced with an SSRM6 and this modification yields free ton for carrying additional SSRMs. The F mitigates its severe lack of range with MASC, allowing it to very quickly close the gap and cripple other light Mechs, and combined with improved jump jets makes it the most agile Osiris variant. However, half of the F's lasers are carried in its right arm, so care must be taken to protect it from fire. In addition, the Osiris F is the most expensive variant available, costing 41 000 CBills. It excels at the beginning of terrain control game mode, dashing quickly with its MASC and improved jump jets to take over capture zones. A long range alternative to the E, the Osiris G is capable of outputting its, slightly greater but still relatively anaemic, full firepower from a less extreme 900m out. The E's shortest ranged armament is an ERPPC accompanied by an LRM5 and a duo of AC2, with its damage dealing potential split relatively equally between weapon platforms. Overall, the Osiris G is an effective long-range sniper or fire support Mech and capable of jump sniping, although it carries less armor than some variants and should avoid brawls at all costs. This short-range weakness is excaberated by the loss of iJJs, making it far more difficult to escape dangerous situations and the fact that in order to use their full firepower it must run active radar, so the pilot should do their best to stay as close to the max range of its main weapon as possible. However, the AC2s can be extremely useful in hunting down Battle Armor, especially when they're in mid-jump. The Osiris was essentially modeled after the Clan Dragonfly and designed by the same engineers who designed the Anubis. While the limits of Inner Sphere technology forced the designers to skimp on the specifications somewhat, the Osiris does maintain the same speed as the design it is based off of with its powerful Pharaoh 240 XL. The armor and jump capacity are sadly lacking, however, as the Osiris can only jump half as far as the Dragonfly with its four Rawlings 61 jump jets and is armored with StarGuard Ferro-Fibrous. The Osiris was designed to be a fast, hit-and-fade style offensive platform and can perform well in that capacity with its awesome speed, although it does appear to rely too heavily on its mobility to protect it from damage.